A street view of our SproutsIOs in the Congress Street kitchens of Barbara Lynch Gruppo. Just as winter began to descend on our city in November of 2015, we planted a garden in the world-renowned kitchens Barbara Lynch. Collaborating closely with her team of chefs, we launched our inaugural Tastemaker Program. Together we explored the possibilities of Personal Produce™ and made culinary magic. Born and raised in Boston, Barbara Lynch is a fixture of the city’s food scene. She is the founder of Barbara Lynch Gruppo, a collection of entities offering unique and memorable culinary experiences. When we sought a partner for our first Tastemaker Program, we were interested in BLG not only for their produce and flavor expertise, but also because of their support and passion for female entrepreneurship evident by Gruppo’s Executive Chef, Michele Carter. SproutsIO believes in creating opportunities for women to lead in technology, as does Barbara Lynch in supporting women to lead in the culinary arts. 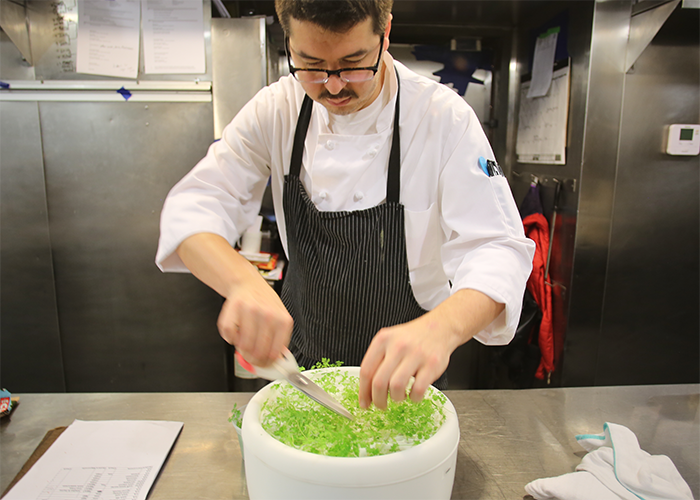 Chef Ben Weisberger harvesting fresh chervil at No.9 Park. Our partnership began by meeting with Chef Michele alongside No. 9 Park Chef de Cuisine Ben Weisberger and Menton Saucier Brian Krieger to develop a customized growing program for BLG. Working hand in hand, we crafted a plan to cultivate specialized produce with SproutsIO that suited their menus and lived up to the high standards of their organization. SproutsIO systems were installed at both the No. 9 Park and Congress Street (Drink, Menton, Sportello) kitchens, allowing the Gruppo team the opportunity to develop unique flavor profiles with SproutsIO. An array of specialized produce including chervil, lovage, and red mustard were all cultivated in the restaurants’ kitchens. SproutsIO was a useful tool for the Gruppo team that streamlined the process of taking produce from seed to plate. By cultivating delicate herbs like chervil in-house, Gruppo avoided the food waste typically associated with discarding herbs damaged during shipping and improved overall yields. SproutsIO also eliminated the need for washing or refrigerating. Instead, produce was harvested the same day it was used, notably in No. 9 Park’s critically acclaimed prune stuffed gnocchi, Menton’s tortellini en brodo, and Sportello’s garganelli with polpetti. Additionally, specific Spring produce was grown and used for menu planning at Menton, allowing the team a head start on experimenting with traditionally seasonal flavors. Left: Yellowfin tuna with hearts of palm, sunchoke, truffle, and SproutsIO-grown red mustard greens at Menton; Right: Menton’s popular “Tortellini en Brodo” topped with SproutsIO-grown chervil. It was a pleasure to see the Gruppo team use our technology to express their extraordinary creativity, crafting beautiful and flavorful meals to the delight of their patrons. Our first Tastemaker Program was a resounding success thanks to their enthusiasm and skill, but this is just the beginning. With more collaborations forthcoming, we are excited about future innovations and novel applications of Personal Produce™.